We would all do well to regard the world, and each other, with far less complacency than seems the norm these days. Great post, Mike. Thanks, Gary. I knew that you were a kindred spirit for my thoughts on this topic. Thanks. I too enjoy sparrows and take lots of photos of them. I used to think of them as nondescript brown birds, but as I have looked and them more closely and observed them at length, I’ve discovered the diversity and personalities of the individual birds. Very thoughtful. I love the phrase, brilliance of the ordinary. Would that we all take a few moments, a few seconds each day to ponder on the brilliance of what we encounter each day. Thanks for the post! I like your chickadees and I’ve never seen one, in the feather that is. They are beautiful, common or not. I like them a lot too. There is something simple and elegant about black and white! Is this the same as the Black-capped Chickadee? We see those up here and it looks familiar. In any case, it’s a great shot. There are some minor differences between the two, but the range is one of the primary differentiating characteristics. I like that poem. I also like chickadees. 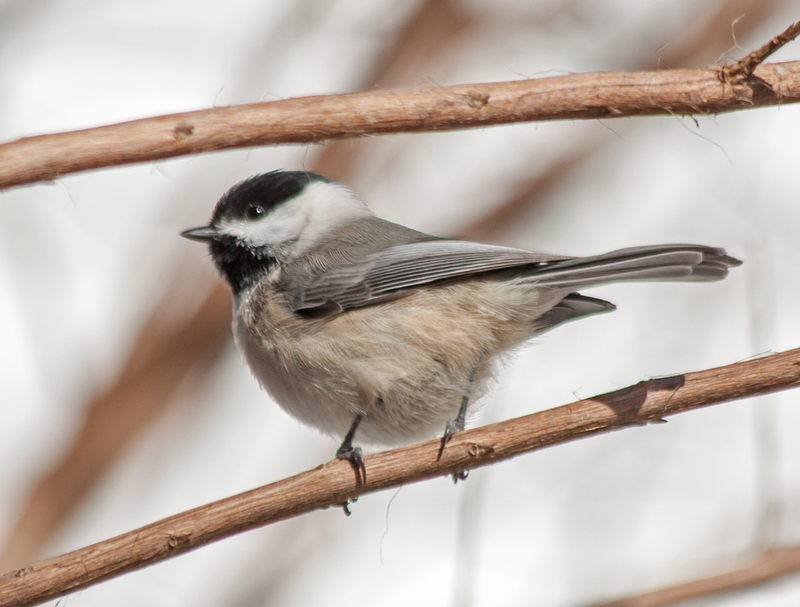 It doesn’t feel like spring has really arrived unless I hear the mating call of the black capped chickadee.